The Dishes are very excited that It Had To Be You will be released in just nine days! Are you reading the Lucky Harbor series? Do you like sneak peeks of upcoming books? What are you looking forward to this month? Grand Central Publishing is giving away a copy of It Had to Be You to one randomly chosen person who leaves a comment on today's blog! 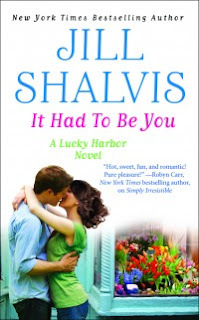 I'm up to date with the Lucky Harbor series, so I'm definitely looking forward to "It Had to Be You." I'm also looking forward to Jill Sorenson's "Freefall"and Jaci Burton's "One Sweet Ride." I need to start reading the Jaci Burton series. Andrea raves about those. I'm not familiar with Jill Sorenson's "Freefall." Off to check it out! Thank you for the excerpt. I love the Lucky Harbor series, and have been counting down the days til "It Had To Be You" is out. You're welcome, Amber! Be sure to check back to see if you're our winner! I am not up to date with the series, but definitely something to look forward to. They look like fun, don't they, Mary? I have enjoyed the Lucky Harbor series. The characters are fun and realistic. I am looking forward to reading Bare It All by Lori Foster. I love sneak peeks of upcoming books, it just builds the anticipation! I'm not caught up on the Lucky Harbor Series, but I've enjoyed the ones I've read so far. Along with Jill's book, I'm also looking forward to Eloisa James' Once Upon a Tower. I've read a few of the Lucky Harbor, and the Animal Magnetism series. I just love Jill's books, they always make me laugh and are fun reads. Sneak peeks are enjoyable, it makes me happy to know books that I look forward to are soon to be released. I'm really looking forward to Karen Hawkins' How to Pursue a Princess, Lori Foster's Bare It All and of course, It Had to Be You! Hi Ada! HOW TO PURSUE A PRINCESS is another one I'm looking forward to. Karen Hawkins has such a wonderful sense of humor! I've only just started to read this Lucky Harbor series. I've read the first three books. I especially enjoyed Sawyer and Chloe's love story in HEAD OVER HEELS. I'm looking forward to catching up. Luke's story in IT HAD TO BE YOU sounds great! Keep the Lucky Harbor series going!! I'm looking forward to reading: Deeanne Gist It Happened at the Fair, Karen Hawkins The Scottish Princess, Diana Palmer The Protector, Jennifer McQuistan's It Happened In Scotland and IT HAD TO BE YOU by Jill Shalvis!! That's a great list, Laurie. I highly recommend Jennifer McQuiston's IT HAPPENED IN SCOTLAND. Loved that book! OOPS Karen Hawkins book is HOW TO PURSUE A PRINCESS! I have really enjoyed the Lucky Harbor series...would love to win this book which continues the story! Glad you're enjoying the series, kayjax! Thanks for stopping by. Be sure to check back to see if you're our winner! Now that's a high compliment! I have enjoyed the Lucky Harbor series. :) I love sneak previews too! :) I am looking forward to the summer! I am looking forward to the summer! Oh, me too! It's been a cool month of May here. I'm ready for some swimming pool temps! I love Jill's Lucky Harbor series and can't wait for Luke and Ali's story. Thanks for the preview. I've enjoyed all of Jill's books that I've read. I'm afraid I have a few to catch up on but I've read many of her books. No, I haven't been reading the Lucky Harbor series; I've obviously been missing out, though, as I LOVE the excerpt! If they are new-to-me authors then yes; I do like sneak peeks. If they are written by my favorite authors, I just dig in, no matter what the excerpt or back book blurb says. I am looking forward to reading Andrea Laurence's A Very Exclusive Engagement this month (or next month, as this month is going by way too quickly for my liking). Don't remember why and it doesn't really matter, as I've enjoyed several of her books already. I've only read 1 of the Lucky Harbor books and it was good. I've read the first 2 in the Lucky Harbor series and thought they were a blast! PJ, I love Lucky Harbor and am eager for the next book. I'm always happy to have a sneak peek. Yes, I love this series! All of the books are keepers to reread. Can't wait for this one & the sneak peeks are great! I love sneak peaks wish I could get on a lost for ARC's I love new books!! Thanks for the sneak peek!! I'm waiting for the whole book!! I love Jill's LH series. Count me in. Thanks. I have read all of this series, so would love the new one.